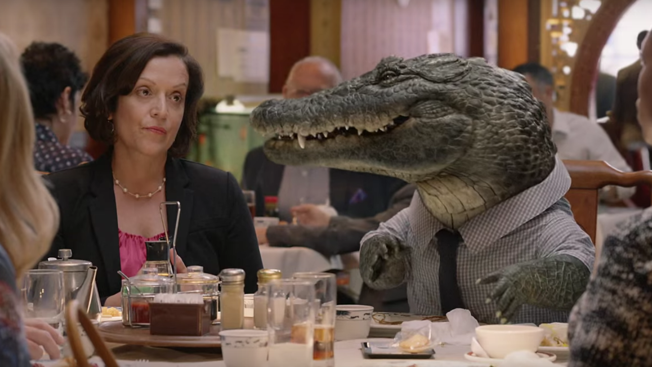 It turns out there are advantages to being an alligator, like dodging the check when eating out with friends because your arms are just too short to reach it. It's far from Geico's first bout with a talking animal. The menagerie includes Caleb the camel and Maxwell the pig, not to mention the gecko himself. And while this new addition doesn't have the same catchphrase potential of his camel colleague, or the infuriatingly unforgettable squeal of his pig counterpart, it really is kind of brilliant, because it's true to nature: Alligators are absurd in their proportions … and of course they'd be shifty mooks with a weakness for crispy duck. Other spots in "It's What You Do" include a mom who always calls her son at the worst possible time to vent about his dad; the band Europe singing "Final Countdown" to a microwave; and a pair of golf announcers whispering, even as a player gets devoured by a kraken—no more directly related to car insurance than alligators or geckos, but great for underlining Geico's value in entertaining and memorable ways. Maybe, in the alligator's next appearance, he can pump iron with the Geico bros … assuming his puny little arms can handle that.